Love the photos from New Hampshire! I'm dying to know what the snorkels are for too! With all the rain we've had lately, my first thought was that you were preparing for flooding! Will it ever stop raining? I hate to complain about the weather, but five days of rain is getting me down. It's still hot in DC too, so I've been feeling pretty hot and soggy all week. Not a great look, I have to say. Good thing is that Jeff and I are headed to Orlando this weekend to see my family. We're all getting together for the first time since my brother returned from Afghanistan. Yay! 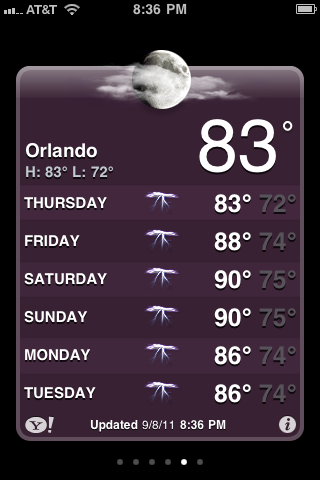 Then I looked at the weather in Orlando. Boo! My Dad promises me that it will just be the typical/daily afternoon thunderstorm that only lasts an hour, but I'm just not so sure. More hot and soggy??? Enjoying the Small Things: Read about the blog here and read about the birth story of Kelle's second daughter Nella here. It's incredible, so raw and honest. I literally cried at my desk when I read it. If you only read one of these, read this one. Nie Nie Dialogues: Nie was in a near fatal plane crash that burned over 80% of her body but when reading the blog, you'd never know it by her attitude and outlook on life. She has four children and is pregnant with her fifth. Tales of Me and The Husband: Bridget was the student/babysitter, Steve was the Professor. The love story is super interesting. Read from the bottom up. E Tells Tales: Mike is 39 years older than Elizabeth. They fell in love, got married and had a baby... but there is a lot more in between. Read their love story here. Again, read from the bottom up. Fascinating, right? However you feel about their choices etc, I think it's admirable that these women shared them with the world, knowing that some people may questions those choices and decisions and feelings. Do you read blogs that have big story backgrounds? What are your favorites? Your dad is right! My parents live just outside of Orlando and every time I go that is the weather forecast. It will be sunny in the mornings and a quick (half hour-hour) rain shower around 3pm every day. That's just the time of year. I actually love it. 3pm is vacation naptime in the Walker household! recounting a 54 year old alaskan man who went to the philippines one winter in search of a bride...and found one - a lovely 19 year old girl. They live in alaska with two sons now. But there's tons more to that story, of course. I personally keep following because i find it a bit more creepy than sweet, but I'm sure it's open to interpretation. Fascinating... I'm beginning to see a theme! Will have to check that one out too, thanks for the suggestion! Thanks for sharing these blogs -- I am already in complete love with Enjoying the Small Things. For another moving story -- but be warned, as it will definitely make you cry -- check out http://www.injennieskitchen.com/. Jennie is a food blogger who recently and suddenly lost her husband. It is a jarring reminder of how life can change in an instant.